Last weekend offered a break in the weather for a couple of days and I (like an awful lot of other people in Assynt, I should think) was able to get out in the garden on both days – what a luxury! I made good use of the time, as you may imagine – in this instance, clearing heather and grass from what I want to be just a moss garden, and also taking the shears to the small privet hedge that divides our raised vegetable bed and the rockery. It was lovely out in the warm sunshine, listening to the cuckoo singing away down in the strath as I worked. Gardening up here is marginal at best, what with a lot of rain and winds that can regularly reach gale force (sometimes, but rarely, hurricane force!) and are normally laden with salt from the sea. Not a huge amount of sun or really warm weather either, although we do have the advantage of it being light most of the 24 hours in a day at this time of year. It is amazing, taking these things into consideration, how much will grow up here. Of course, being just a mile from the sea, we don’t get a lot of very hard frosts in a normal winter – although in recent years, our winters haven’t necessarily been very normal! One has to experiment and see what will grow in any given garden. Some things will grow in some gardens but not in others – even ones which are just down the road! 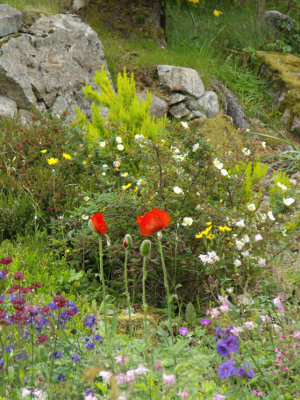 There is a very active gardening club in Drumbeg, to the north of here up the coast road, and the members of that seem to have good success with their gardens, in spite of conditions. And their annual bulb show in Spring normally has a lovely display of bulbs – albeit that some are grown indoors! Of course, that can be the crux of the matter. Most serious growers, especially of veg, have either a good greenhouse or a polytunnel, or both. Anything like that has to be built very strongly, though, to withstand the wind, and preferably sited in a sheltered spot (although I have to say that our greenhouse is sited in the full blast of the wind, but being plastic rather than glass, and manufactured in windy Denmark, it stands up to it very well – touching wood!). In the greenhouse I can extend the growing season quite dramatically, especially as we heat it in winter. I also grow limes in there, which is great fun, and they come in very handy for the odd gin and tonic! Our garden, like all round here, is pretty rocky. In many places, the soil depth is about ¼ in – which can be very frustrating if you have the perfect plant for the perfect spot, but no soil to grow it in! On the plus side, though, it does mean that we have some standing stones that many people would give their eye teeth for – so there are compensations. At one time, a croft house stood on the site of our house, and so there is a part of the garden which has been cultivated for many years and is my main growing area for things such as roses. We have deer fencing completely surrounding the garden. We got away without proper deer fencing for the first five years that we were here, but when our neighbours across the way improved their fencing, the deer discovered our garden and nothing was safe! So our friend Ray came and up-graded the fencing, and we bought a posh new gate to go across the drive, which does the job when closed at night. 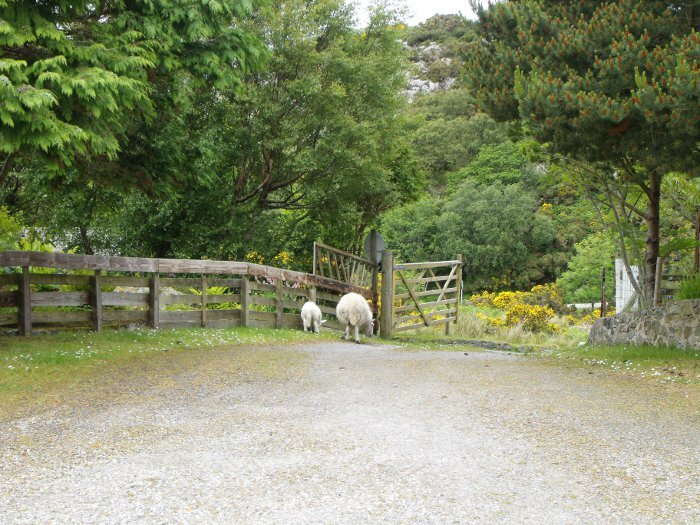 We already had fencing and gates to prevent the sheep from getting into the garden proper, although we welcome them onto the drive. They keep the grass and rushes down, and clear up after the wild birds, who make a terrible mess under the bird feeders! The sheep leave wee “messages” behind them, which I gather up and pop into the compost bin – so everyone is happy. It is delightful at this time of year to see the lambs keeping close to their mothers – and when it is raining, a mum and lamb are frequently seen sheltering under a big pine tree, happily chewing the cud. Of course sometimes, and due entirely to carelessness on our part, sheep do get into the garden and cause some damage – if only with their heavy feet crushing young plants. One got into my vegetable area the other day and ate a few things (especially my beloved alba roses) but I was philosophical about it: the plants will all recover – and at least it prompted my Old Man to fix the lock on the gate! The sheep round here are North Country Cheviots, which are a middle-sized sheep, very tough and hardy. Just now, they look like barrels because they still have their coats on – or at least most of them do. Some of them rub their coats off themselves, thus saving Donald, who owns the sheep in Strathan, the expense of getting them sheared (which won’t happen until the middle of July). These sheep live free on the “common grazings”. That means that they are free to roam the land within the common grazings of the parish (or a division of the parish, in our case, as the parish of Assynt is 50 square miles!). The road runs over the common grazings, which means that the sheep have “right of way” – not only sheep either, but cattle and sometimes pigs! The sheep are very street-wise, though, and their lambs quickly learn from their mothers what to do to keep out of danger on the roads. There are occasional accidents, but they are fortunately rare. Sometimes a sheep will lie asleep in the middle of the road, and of course we all do our best not to disturb it but to drive around it! This entry was posted in Animals, Plants and tagged deer, gardening, sheep, weather. Bookmark the permalink. Congrats for the blog, have bookmarked you and shall check in weekly to see what I can see.